Friday before last found us scrutinising the wind forecasts with a little more urgency then normal. 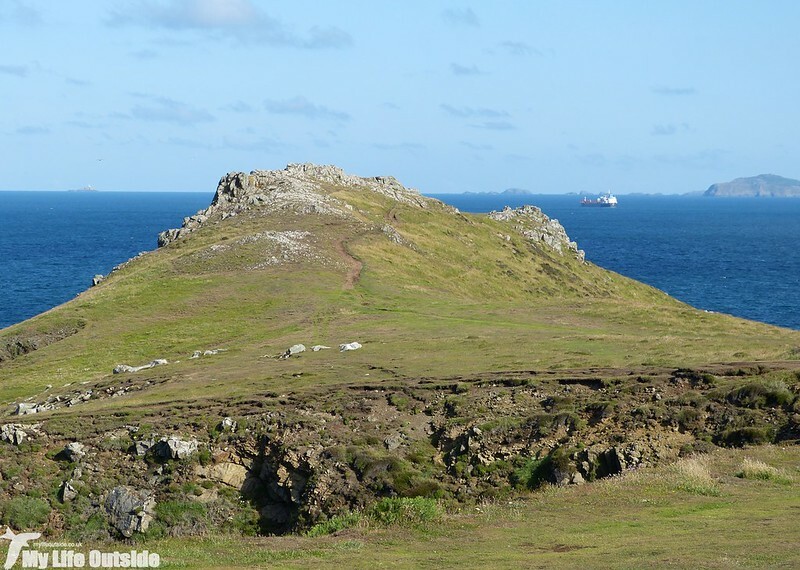 That day had seen sailings to Skomer cancelled as a result of strong northerlies and conditions didn't look much improved for the next twenty four hours or so. Now for someone who freely admits to not being much of a morning person, any early rise needs to be for a very good reason and be pretty much guaranteed something rather special in return. A potential wasted trip to Pembrokeshire didn't really fit that bill but what the hell, we all need to take chances from time to time. 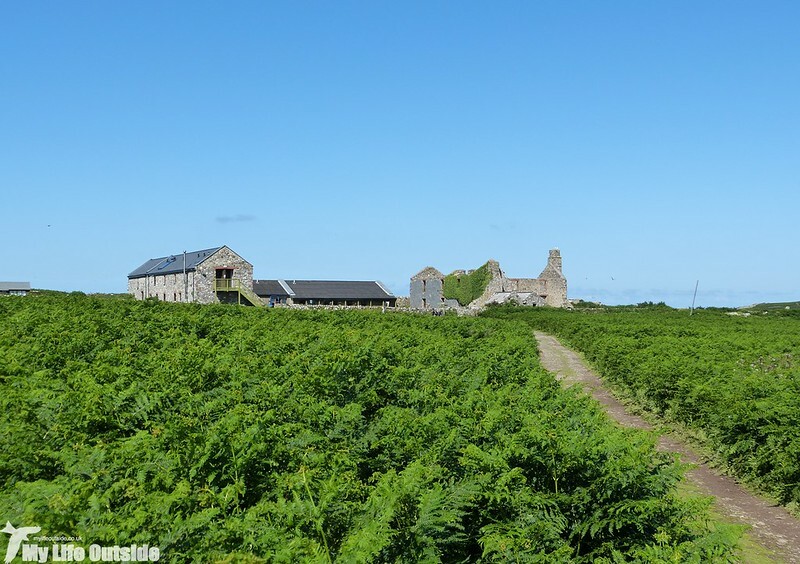 So it was that we found ourselves pulling into the National Trust car park at Martin's Haven a little after eight where we duly showed our membership card and were directed where to park. Conversation seemingly over I had to prompt on news of the boats and was surprised that the attendant didn't know. Strange given that is the main reason for the majority of visitors here! Thankfully a passer-by shouted across that they were indeed running and we hot footed it down to join the queue which even at this early hour was over twenty people strong (though still thankfully shorter than I'd feared given we are in school holiday season). We were all processed in quick order and with an hour or so to kill kept with tradition and headed up to the old Deer Park. The views were, quite simply, stunning and I had my fingers crossed that the almost cloudless sky would stick around for the duration (it did). As on our last visit earlier in the year there were plenty of Whitethroats and Swallows about but both were now proving much harder to photograph with the latter having finished with their nesting activities around the toilet block (oh the glamour) and most Whitethroats taking advantage of the much thicker ground cover to keep their movements hidden. It was nice to see several family groups of Linnets about, though even at this tender age the youngsters seem to have learned that photographers should be avoided at absolutely all costs. Not to worry as I had my heart set on a pair of Chough which then did a perfect vanishing act never to be seen again. Out at sea Kittiwakes and Fulmars were passing the cliffs at close range and beyond were our first Gannets of the day raising hopes that we'd get even better views during the crossing. When the time came that was exactly what we did get with one individual first hanging in the sky directly overhead before then crashing down into the sea just off our port side. If you thought a Gannet's dive was impressive when seen at distance then you can probably imagine just what an experience this was. No prizes for guessing that it went straight in as one of my top wildlife encounters this year. 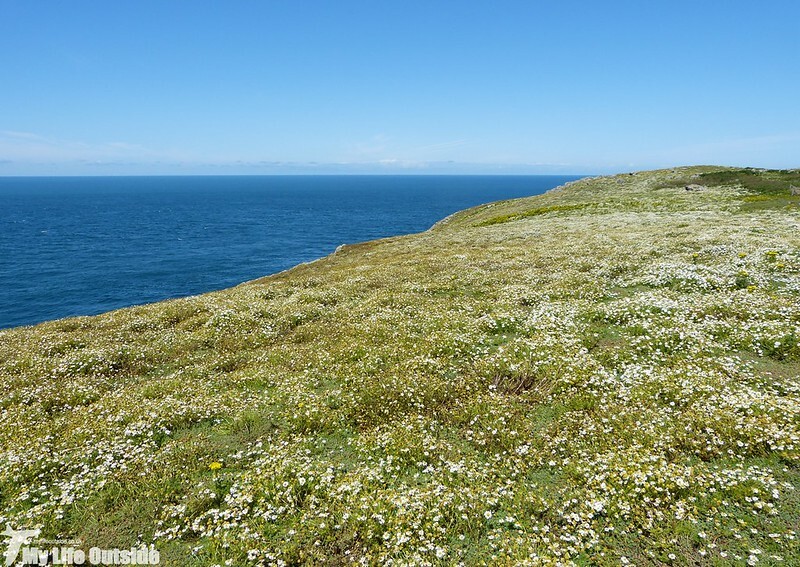 Stepping on to Skomer itself felt very much like experiencing a completely different island from that which we'd left a few months earlier. Gone were the vast swathes of Bluebells to be replaced instead with Bracken making for a very different view towards the farm complex as seen above. Elsewhere those same purple wonders had given way to masses of Ragwort and what I refer to as Daisies but more than likely have a proper name. The one major surprise was that despite acres of yellow we didn't see a single Cinnabar Moth caterpillar, a point which Paul also commented on here. If anyone knows why I'd be very interested to hear. It wasn't just the plants either which had seen a shift. Although we had seen Guillemots and Razorbills during our crossing they were completely absent from their normally reliable perches adjacent to where the boat docks and only present in very small numbers at the Wick. Instead they had been replaced with large numbers of Kittiwakes (on the cliffs) and hoards of Gulls pretty much everywhere else. Wherever we walked throughout the day it was to an accompanying soundtrack of Gull orchestral magnificence at full volume. 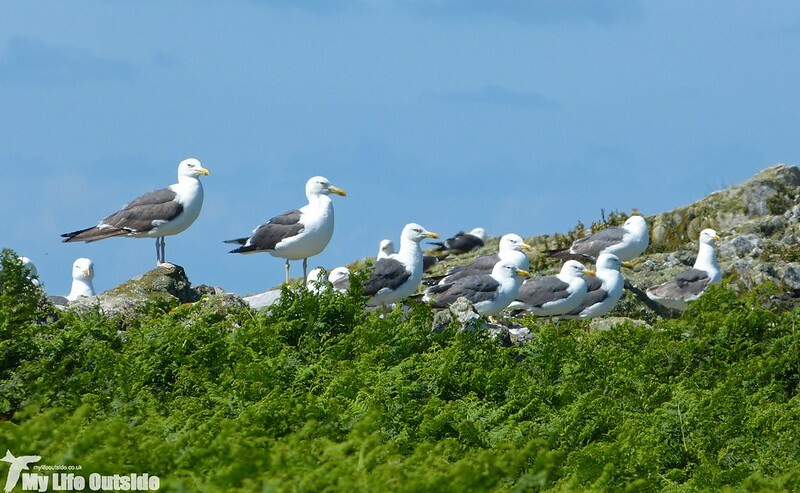 Chief proponents of this cacophony were the Lesser and Great Black-backed Gulls which lined every wall on the island and where that wasn't possible had managed to cover much of its ground surface as well. Every now and again the background din was lifted a couple of octaves higher as some perceived threat or other was spotted, spreading panic like wildfire through the masses. Normally we couldn't see any cause for concern and put the whole thing down to group paranoia but on one occasion we did spot a large raptor whose presence had caused absolute pandemonium. At the time we though it was a Buzzard but after getting home discovered that it had actually been a juvenile Marsh Harrier! Thinking back the identity was obvious but it simply hadn't occurred to us that such a species would be on a small Welsh island. I don't think the Gulls expected to see it either. With so much big action going on it was nice to find moments of quieter relief dotted around the island. Whether it was a juvenile Wheatear, Sedge Warbler with beak full of insects or skulking Whitethroat, there was plenty to focus our attention. 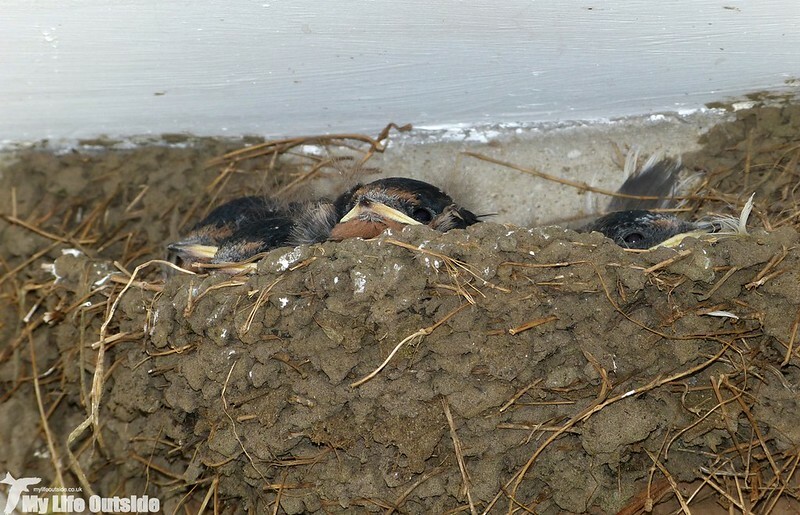 My personal favourites though were the Swallows which, as with the Martin's Haven birds mentioned above, had chosen to nest inside the toilets. I only noticed them through a sudden chattering above my head and looked up to see these three small chicks staring back. Given the time of year I presume these are a second brood or perhaps just late starters but they were a very nice sight having gone all year having seen not a single occupied Swallow nest. Of course, good as all this was, the main attraction was always going to be the Puffins. Due to other less enjoyable commitments we had missed the period of peak activity but were pleased to find several birds still returning to their nests at regular intervals, beaks stuffed full of fish. This obviously meant that I needed to try and get that 'classic' pose and in the end came as close as I've ever managed before i.e some work still needed. Puffins are one of those species which seem to be able to portray a huge amount of character and I genuinely saw a sense of confusion in a couple of birds who landed only to find that they couldn't relocate their nests. Ground vegetation is now far lusher than when nesting holes were originally chosen and as a result they aren't always the easiest thing to spot. 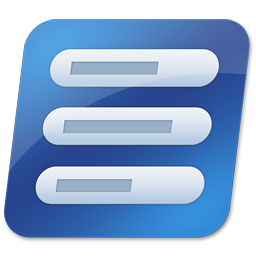 Cue much hopping around, back and forth, until finally the delivery could be made. Despite the plan for this trip being to take a more relaxed approach we still ran out of time when there was much left to do. 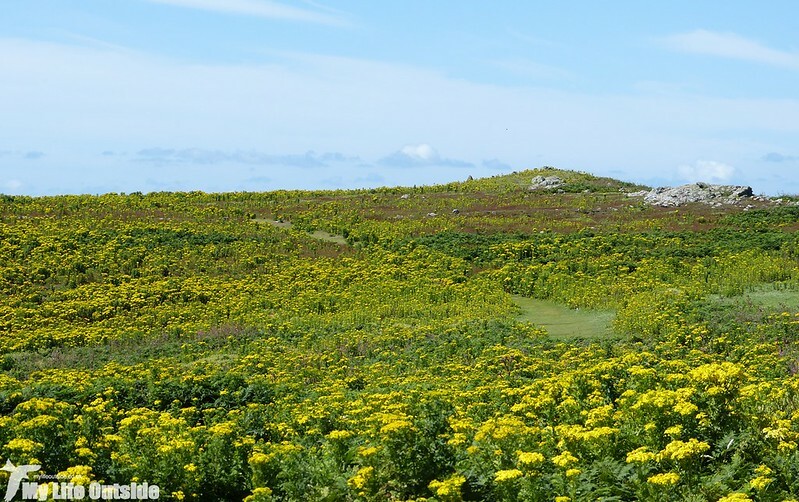 The only solution is that next year we shall have to take a weekend break on the island, something which I've had my eye on for a while and which should reveal Skomer in a whole new light. I can't wait. 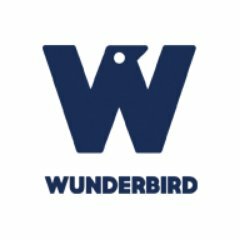 Great collection of images! My favorites are of the Puffins! Awesome! 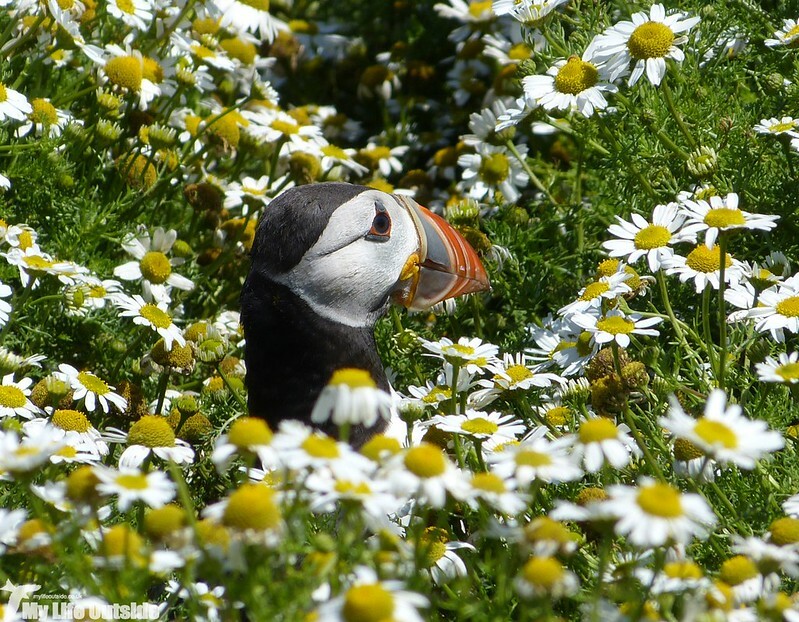 Love the photos of the Puffin amongst the flowers! Thanks. That's one of the 'classic' shots I was after. 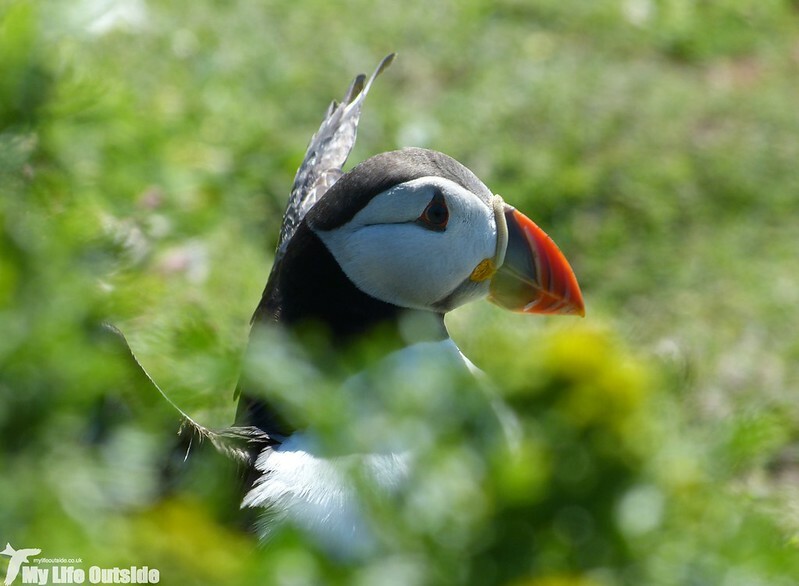 HI AdamI looked reading about your trip to Skomer adnall the birds you saw. 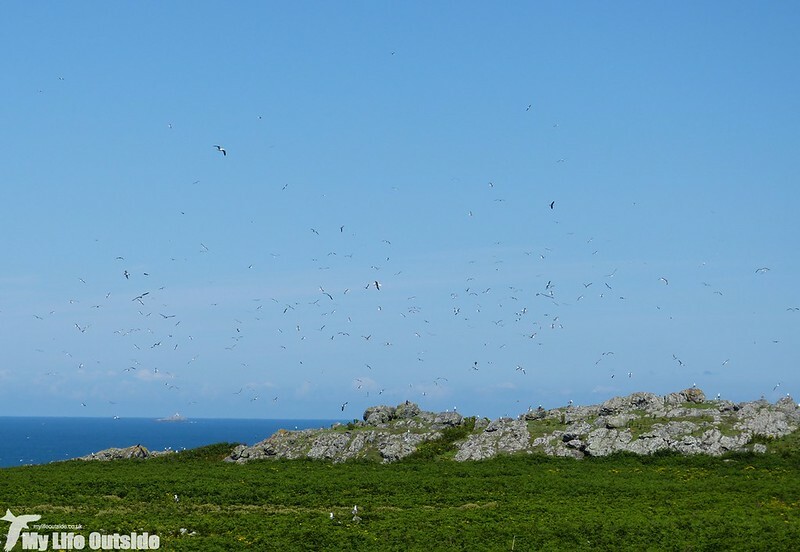 This year,for the first timeI went to great Saltee,off Wexforf, Ireland and it was fabulous. You cannot stay on it but we stayed at accommadation adn went over 2 day. it is only takes 15 minutes to land. I have not posted about it as yet and proably won't until about December as I have so many other photographs that I am trying to catch on on showing. Sounds like a great place and glad you enjoyed. Very nice Adam - we were there last Tuesday as you know, great. I can't over-recommend staying overnight, you will love it for many reasons. Like shearwaters everywhere. 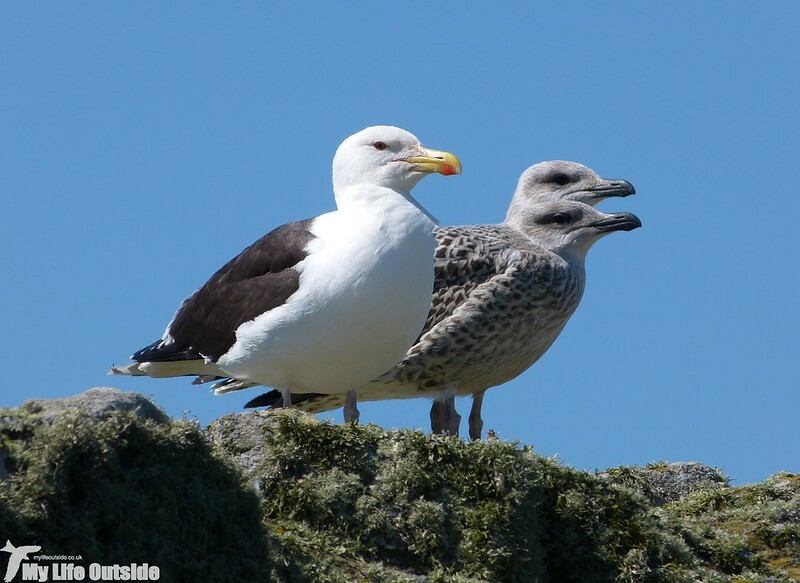 Isn't photo "P1140934 - Lesser Black-back Gulls, Skomer Island" actually Great Black-backed Gull and juveniles? Very black, massive bill with big overhanging tip etc, pinky legs on adult (juvs of both species have pinkish legs). 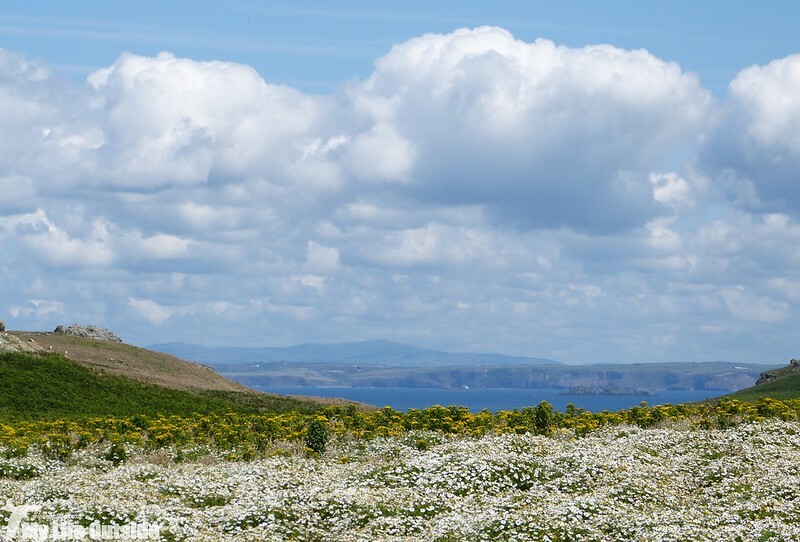 There are about 140 pairs on Skomer, they were all over the place when we were there. Living mainly on shearwaters by night and whatever comes along by day. Paul, you're right! That'll teach me to check my photos more closely next time. Those Puffin shots are amazing! I can only imagine the thrill seeing the Gannets diving so close by! Thanks Sondra and Gannets diving is definitely on of nature's highlights. 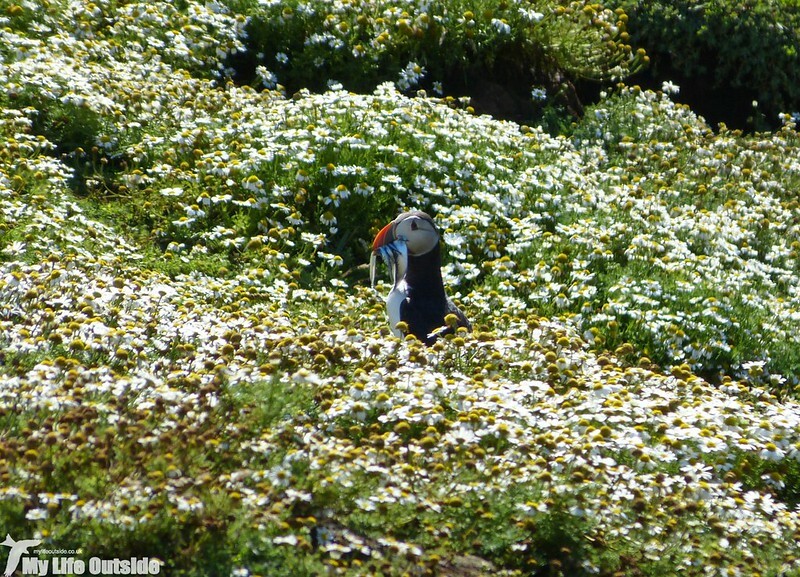 What a great trip, the Puffins are always to fun to see, and amazing with their heads sticking up out of a field of flowers. I had a similar experience with swallows, except the nests were above the restroom lights outside. The mother looked quite irate that I had noticed her. The chicks seem more relaxed. 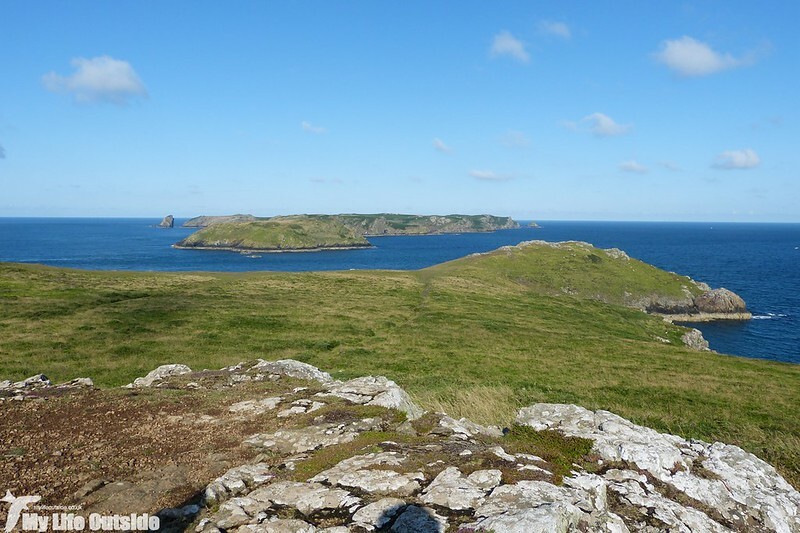 Skomer is somewhere on my list of places to visit. I really must sort that one out for next year. Love the Puffin shots. wow, what an incredible place to explore. 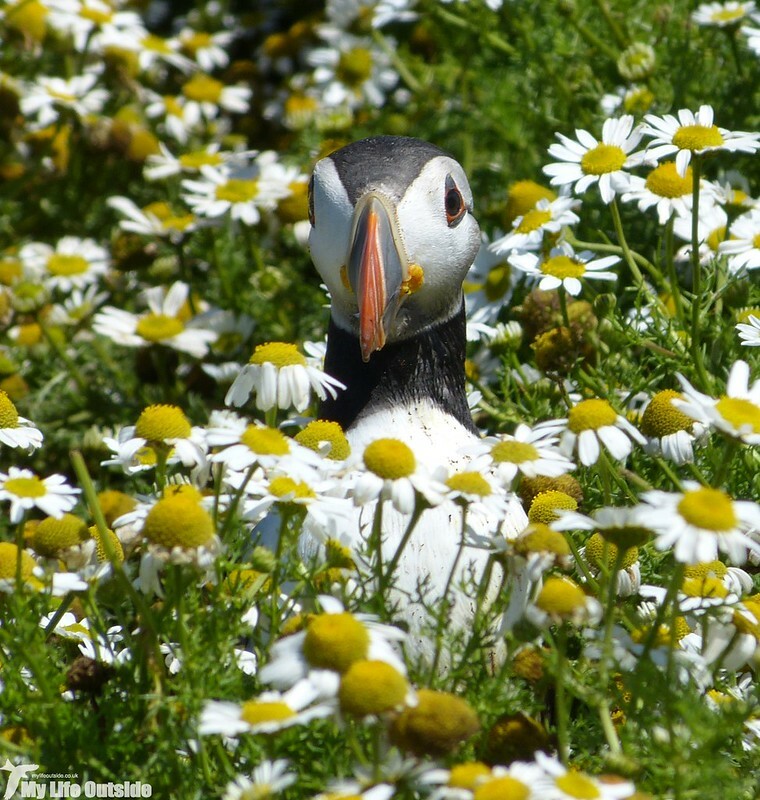 the photographs of the puffin surrounded by the flowers are wonderful! Such a beautiful place! And you got some awesome photos. I absolutely love the puffin in the daisies!!!! 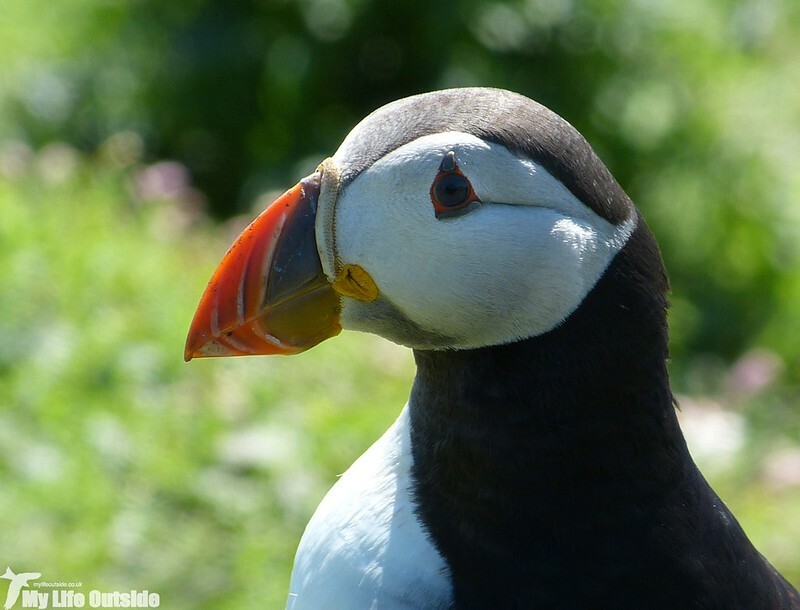 It must be the week for puffins. They look like they have plenty of personality. I've never seen gulls that look like that before. It looks like an interesting day outside.